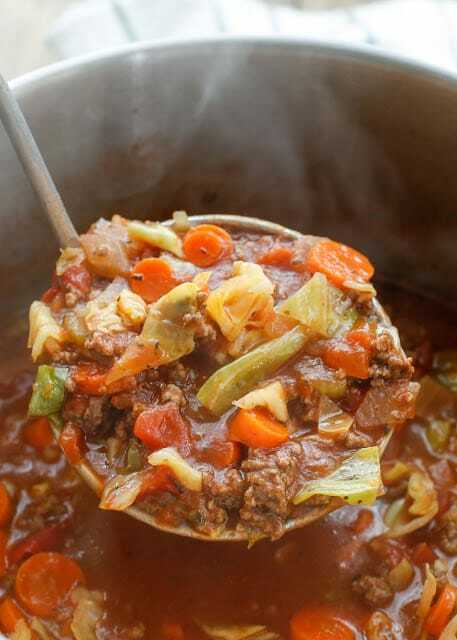 Hearty Italian Vegetable Beef Soup is filled with chunks of ground beef, plenty of vegetables, and generous Italian spices. This soup is inspired by the Italian Vegetable Soup that has been a family favorite for over 20 years. Did you know that Italian Vegetable Soup was actually the first recipe I posted on this blog almost 8 years ago? My husband has been taking one version or another of this soup to work with him for lunch at least a couple times a week for years. The soup freezes beautifully and I almost always have a few servings tucked away for those lunches. This Hearty Italian Vegetable Beef Soup is deliciously filling while remaining full of nutritious veggies and completely grain-free. As an added benefit to anyone tackling a new way of eating this year, the soup happens to fall under the “approved” category for both Whole30 and Paleo eating plans. Me? I just like this soup because it’s delicious. It’s so comforting and, as the name suggests, hearty. 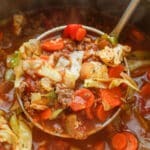 This Vegetable Beef Soup feeds both body and soul. For what it’s worth, we are all eating the same foods Sean is, I’m just adding in a handful of Fritos on my salads, wrapping my eggs in a tortilla, and heaven forbid I ever fully give up chocolate. I’ve been sifting through all of our recipes, finding the ones that will fit into the Whole30 plan and tweaking some others to make them work. 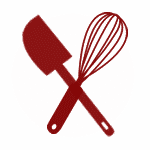 I’ve put together a huge collection of 100+ Paleo Recipes that either fit into the Whole30 category or can be easily adapted to work. This Hearty Italian Vegetable Beef Soup was an obvious one to add to the list. 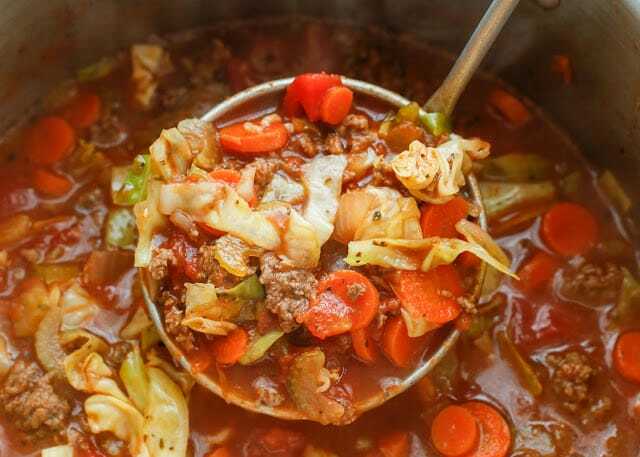 Ground beef makes the soup a good source of protein served up with a generous amount of chunky vegetables, herbs and spices all in a tomato-y base. I use cabbage, celery, onion and carrots as the main vegetables in this soup and I’ve never been disappointed by how economical this healthy soup recipe is. Hearty Italian Vegetable Beef Soup is plenty filling served on its own for lunch or dinner. If you aren’t avoiding grains or gluten, it would also pair well with a loaf of homemade bread or a side of oyster crackers. A nice simple salad would also make a tasty and fresh accompaniment. I serve my family a wide variety of meals and I think, overall, we eat a pretty balanced diet. Still, sometimes I feel like the so-called “healthy” recipes leave me wanting more. That wasn’t the case when I tried this beef and vegetable soup for the first time. This recipe is so satisfying and full of flavor that you won’t feel deprived. I love soups with pasta, potatoes and cream as much as the next girl and maybe more but this hearty veggie soup holds up to all of those comfort foods. Whether you’re trying a Paleo, Whole30 or similar diet, or just looking for a truly remarkable simple soup recipe, you need to give this one a try. Vegetable Beef Soup proves that cooking healthful meals doesn’t need to be expensive or time consuming. It takes little more than tossing everything in one pot and letting it simmer for a while to make a hearty soup that everyone in your family loves. Ground beef is sauteed in a soup pot with garlic and onion until brown and fragrant. Water, tomato puree, diced tomatoes, celery and carrots are added to the pot along with oregano, basil and thyme. Cabbage goes in right at the end of the cooking time to keep it from getting over cooked. The result is perfectly tender cabbage that adds a wonderful flavor and texture to the finished soup. This recipe makes a good amount of soup but you’ll be happy to have the leftovers. Vegetable Beef Soup keeps well in the fridge for a few days and freezes like a dream. I freeze my vegetable beef soup in cup sized containers to reheat for easy lunches. You can reheat it from frozen in the microwave or let the frozen soup thaw first. The leftover soup is delicious both ways. I hope you enjoy this Hearty Italian Vegetable Beef Soup every bit as much as we do! Looking for more easy and nutritious soup recipes? I tried a version of this Italian Soup with Sausage and it was just as delicious. This Green Chile Bean and Vegetable Soup and Mexican White Bean and Cabbage Soup are must tries too. Check out these recipes for Sriracha Beef Lettuce Wraps, Crock-Pot Mediterranean Chicken, Butternut Squash Prosciutto Breakfast Hash, Whole30 Stuffed Cabbage, and Bacon Avocado Chicken Salad for more Whole30 dinner inspiration. Kitchen Tip: I used this pot to make this recipe. In the bottom of a large pot, over medium-high heat, cook and crumble the ground beef along with the garlic and onion. When the beef has browned, about 8 minutes, add the carrots, celery, and water to the pot. Increase heat to high and add the diced tomatoes, crushed tomatoes, tomato sauce, oregano, basil, thyme, salt, and pepper. Cover with a lid. When the soup begins boiling, stir, and reduce heat to medium; simmer uncovered for about 15-20 minutes until the carrots are tender. Taste the soup and adjust the salt as desired. Stir in the cabbage. Simmer a few more minutes, just until the cabbage has wilted. Top with cheese, if desired, just before serving. FREEZER TIP: This soup freezes well and can be reheated in the microwave straight from the freezer or allowed to thaw in the refrigerator and then reheated on the stove or in the microwave. I store it in two cup containers for easy lunches. Hearty Italian Vegetable Beef Soup is filled with chunks of ground beef, plenty of vegetables, and generous Italian spices. This soup freezes quite well making it perfect for easy lunches. In the bottom of a large pot, over medium high heat, cook and crumble the ground beef along with the garlic and onion. When the beef has browned, about 8 minutes, add the carrots, celery, and water to the pot. Increase heat to high and add the diced tomatoes, crushed tomatoes, tomato sauce, oregano, basil, thyme, salt, and pepper. Cover with a lid. Once the soup is boiling, stir, and reduce heat to medium; simmer uncovered for about 15-20 minutes, until the carrots are tender. Taste the soup and adjust the salt as desired. Stir in the cabbage. Simmer a few more minutes, just until the cabbage has wilted. Top with cheese, if desired, just before serving. Enjoy! Do you drain the hamburger grease? I drained mine. I didn't think it would be low in calories with all that grease. I used cubed chuck roast instead of burger. Really cut down on the grease. I bet that was delicious, Mary. If the soup makes 10 to 12 servings. How large are the serving sizes ? 1 cup or 2 cups? I typically consider this a main dish meal and a serving would be about 2 cups. The recipe makes a large batch and I always plan on freezing it for lunches. How many calories per serving? What is the size of each serving? Why not calculate it yourself? She has provided everything you need to do it. Do you need someone to spoon feed you the soup too? I make this at least once a month now. My family likes it - it's healthy and surprisingly filling - and it makes enough to give us leftovers for later in the week. I use ground turkey instead of ground beef and chicken broth (Better Than Broth) instead of vegetable (because it's what I always have on hand). Using a food processor to chop the onions and slice the carrots and celery is definitely the way to go. I tweaked the recipe a little! I cooked the garlic and onions with the hamburger. And on the side boiled the carrots and celery to make them soft. One those were done, I drained most of the water (leaving about 1-1 1/2 cups) and drained the hamburger. I then mixed in all the tomatoes with the veggies and added the hamburger. I opted out of cabbage personally and added some pepper! Do you have the macros for this? Any suggestions on how to convert this to a crockpot recipe? My whole family loved this soup! I left out diced tomatoes and tomatoe sauce and added another can of crushed tomatoes. Topped with fresh shaved Parmesan! Delish! My family loves this recipe! Even my kids (9,3,1) love it! I'm so happy that everyone loves it, Lacey! 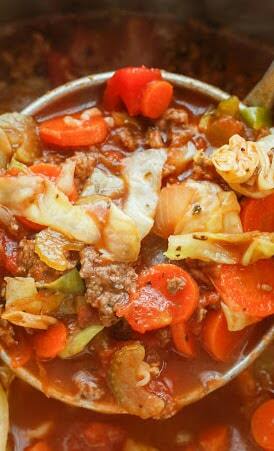 Happened upon this recipe in a random "beef vegetable soup" search and we loved it! Changed it slightly just by using a chuck roast instead of ground beef, but all other things remained the same. Making it again this week. Stellar! I'm thrilled that you like the soup, Patty! It's still one of our favorites. This is one of my favorite winter soups. It is hearty and delicious. I have made it with ground turkey and the beef. I always add cut fresh green beans. We all love it. And it makes so much there is always left overs to freeze.